The Amboyna trial lasted for roughly two weeks and was presided over by the senior legal official on Ambon, the Advocate-fiscal, Isaaq de Bruyn. De Bruyn was a new arrival to Asia and he is conventionally described in Dutch sources as either as a “jurist (rechtsgeleerde)” or as a “doctor and jurist” (doctor ende rechtsgeleerde). The problem was, however, that he appears to have been strikingly incompetent. In this he was not unique as the Company struggled to recruit trained legal officials willing to undertake the long and dangerous journey to Asia, but De Bruyn stands apart because his many mistakes were picked apart by English critics in the decade after the trial. De Bruyn’s ineptitude, which would spark decades of dispute, is readily on show in the key document for the trial, the Confessions and Sentences of the Murderous Conspiracy at Amboyna, which skipped over a number of key procedures conventionally used in trials of this period. We would have wished to have seen the proper legal procedure observed in this case its Instruments drawn up with greater completeness. Isaacque de Bruyne, who as Fiscal acted as prosecutor in this case, and moreover passes himself off as a lawyer and has been appointed as such, ought to have turned his common sense to better account in it. It would seem that the entire council relied on the prestige of De Bruyn’s title and left him to draw up the documents all by himself, and that none one of its members dared add anything, but wholly trusted to the lawyer’s title…We have now come to the conclusion that the severity of justice might have been tempered a little with Dutch clemency (with respect to a nation that is so close a neighbor). 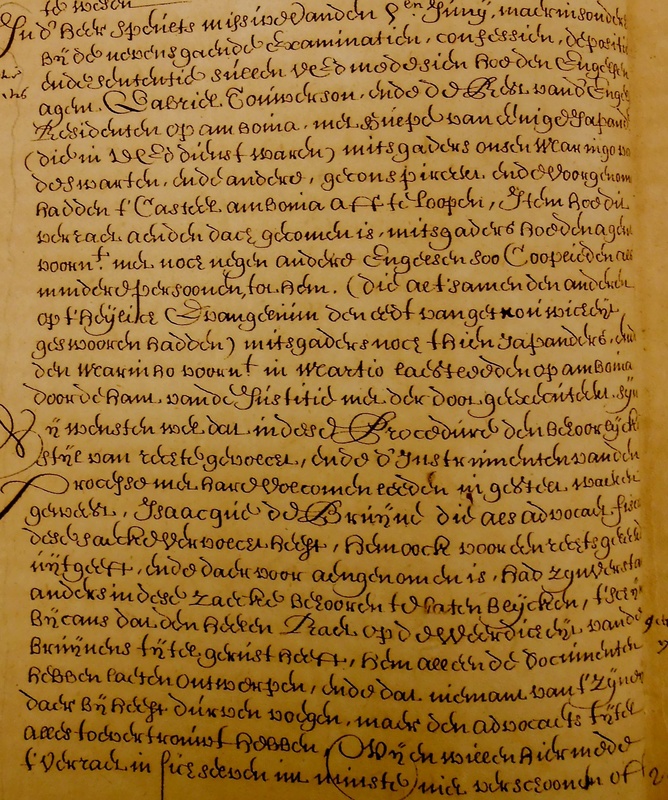 Citation: Governor-General to the Heeren 17, 3 January 1624, De archieven van de Verenigde Oostindische Compagnie, Nationaal Archief, Den Haag, VOC 1080, 30v.